Untapable won today the Kentucky Oaks, by over 4 lengths and in the second fastest time for the race. 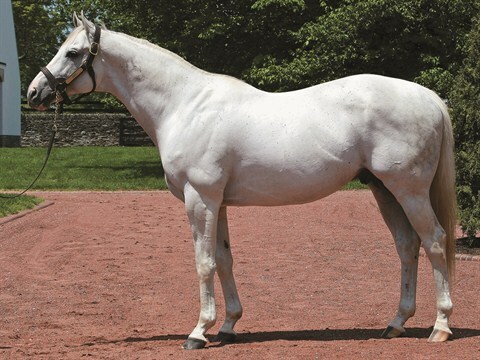 She is also the newest GRI winner for her sire Tapit. And Tapit is leading the sires lists for this year. Is ahead of the second by more than $2M. Tonalist, by Tapit, won the GII Peter Pan Stakes at Belmont Park, becomes the newest graded stakes winner for his sire, who is having a wonderful year, so far. There is a very nice article today in the Paulick Report on Tonalist pedigree. The colt is really very well bred. And Tonalist is now a Classic Winner, GRI winner to add to the list of accomplishments by leading sire Tapit. Two yearling fillies by Tapit (both grey) sold for one million or more yesterday at the Saratoga Sale. Cassat, a gray filly by Tapit won today the Monmouth Oaks GrIII, and with her earnings, her sire has now over $9 million in progeny earnings so far this year. It really has been a remarkable year for Tapit and the Seattle Slew sire line. Was interested to see the Tetrach's tail is still at The National Stud in Ireland! At the Keeneland sale today, there is a gray Tapit colt that sold for $2.2m. A beautiful looking individual, from the pictures. I read a comment today about Trappe Shot, a son of Tapit, that did very well at the recent Keeneland sales, and could be a fine heir to the sire line of Seattle Slew-AP Indy-Pulpit-Tapit. There is an interesting article about Tapit in the BH. Tapit now is leading the sire list by over $4 million ahead of the second. Tapit's fee for 2015 has been raised to $300,000.00. Well deserved, at it's has been a banner year for him, both at the races and at the sales. Another record for Tapit, as a weanling filly sold today for $3 million. Wow this topic began in September 2010 when TAPIT was practically an unknown aspiring sire.